Recent events in the Islamic world have demonstrated the endurance, neglect and careful reshaping of the classical Islamic heritage. A range of modern Islamic movements and intellectuals has sought to reclaim certain concepts, ideas, persons and trends from the Islamic tradition. 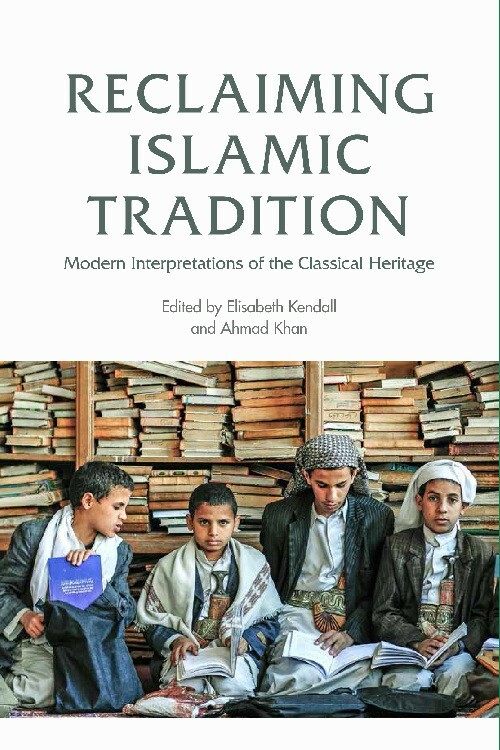 Reclaiming Islamic Tradition: Modern Interpretations of the Classical Heritage profiles some of the fundamental debates that have defined the conversation between the past and the present in the Islamic world. Qur’anic exegesis, Islamic law, gender, violence and eschatology are just some of the key themes in this study of the Islamic tradition’s vitality in the modern Islamic world. This book will allow readers to situate modern developments in the Islamic world within the longue durée of Islamic history and thought. As a member of IQSA, fulfill the required field under Have an account? Sign in and then, click on Login. The Qur’an Seminar website has two principal elements. First, the website includes a database of passages of the Qur’an with commentaries from a range of scholars. This database is meant to be a resource for students and specialists of the Qur’an alike. The commentaries may be quoted and referenced by citing the corresponding URL. Second, the website includes an active forum in which additional Qur’anic passages are discussed. At regular intervals the material on the forum will be saved and moved to the database, and new passages will be presented for discussion on the forum. As a rule, the passages selected for discussion are meant to be long enough to raise a variety of questions for discussion, but short enough to lend that discussion coherence. We hope you will enjoy the content and consider contributing! © International Qur’anic Studies Association, 2016. All rights reserved. Both the resurgence of Islamist politics and the political, social, and intellectual upheaval accompanying the Arab Spring challenge us to reconsider the interplay between the pre-modern Islamic tradition and modern proponents of continuity, reform, and change in the Muslim world. The colloquium therefore invites scholars with an in-depth knowledge of the classical Islamicate heritage to explore modern texts that stake out some sort of claim to pre-modern traditions in disciplines as diverse as Islamic law, hadith, Qur’anic exegesis, politics, and literature. The colloquium will encourage specialists to embark on a hermeneutically sophisticated exercise that avoids some of the extremes to which an examination of how the classical heritage functions in the modern Islamic world has often been subjected. The colloquium aims to move beyond works that contain the tacit assumption that modern Muslims are subconsciously steered by the Islamic tradition, without exerting any sort of agency or control over it, and studies that suggest that modern Muslim thinkers arbitrarily distort elements of the tradition to which they lay claim. Instead, we invite scholars to consider modern re-appropriations of pre-modern concepts, texts, persons, and events, and thereby to transcend an increasing bifurcation between classical and contemporary Islamic studies. This colloquium has been made possible thanks to the generosity of Brian Wilson, a long-standing benefactor of Arabic studies at Pembroke. For more information, please visit here. The latest research in the field of Islamic graffiti in the first two centuries AH in the Middle East is uncovering new information about Muslim society at the dawn of Islam. Most of this information concerns the Islamic faith, the place of the Qur’an and the figure of the Prophet Muhammad, but the oldest graffiti also allow us to reflect on the status of writing during the same period. Thousands of Arabic Kufic graffiti recently discovered in Saudi Arabia and in the wider Middle East reflect an extreme fragmentation due to the quantity of inscriptions scattered all over the area. These Arabic graffiti, which were not subjected to any kind of censorship, are the expression of variation and repetition at the same time : variation of the Qur’anic text and of the attitude of people towards the new religion and the Prophet, and repetition of the religious prayers and invocations. The picture of early Islam emanating from the first Islamic graffiti is one of fragmentation. The field of Qur’anic Studies has been greatly influenced by the medieval reception of the Qur’an text manifested in the exegetical literature and by the theories related to the ‘Qur’anic variants’. The concept of ‘Qur’anic variants’ is deeply rooted in the history of the canonisation of the Qur’an and in the various assumptions made about scribal errors and falsification. My paper will provide a critique of the conceptual tools used in Qur’anic Studies in the last two decades and will propose a new perspective in the study of the textual features interpreted by the medieval and modern scholars as ‘Qur’anic variants’. The new perspective takes the fragmented aspect of the text to be inseparable from the history of its transmission. This paper examines the ways in which hadith scholars went about compiling hadith collections by undertaking a comparative analysis of three similar works written in the same period. The three collections are all arbaʿūn collections – short collections of around forty hadith – which focus on the themes of jihād and martyrdom. The three studied are Suyuti’s Abwāb al-suʿadāʾ fī asbāb al-shuhadāʾ (‘The Gates of the Lucky in the Occasions of Martyrdom’) and his Arbaʿūn ḥadīthan fī faḍl al-jihād (‘Forty Hadith on the Merits of Jihad’) and al-Biqāʿī’s Dhayl al-istishhād bi-āyāt al-jihād (‘The Appendix to Martyrdom in the Verses on Jihād’). I will argue that by closely analysing the material included and excluded from a hadith collection, as well as the ways in which the hadith have been arranged, it is possible to gain a deeper understanding of particular nuances within a text in which a compiler does not give his views openly to his reader. This paper will argue that the ‘hadith literature’ contains a vast, almost infinite, body of texts and the job of the hadith compiler is to fragment this wider body of texts, to reconstitute them, and then to arrange them in order to provide a specific discourse on a subject. This process can be seen in the different ways the three works under consideration in this paper respond to the subjects of jihād and martyrdom. The unique ways in which the Qur’an ‘heard’ select stories from the Aramaic Gospel tradition has been considered by generations of scholars. Yet, only the most rudimentary consensus has been established about the nature of the texts with which the Qur’an’s audience was familiar, let alone the ways in which the Qur’an used these texts. The Qur’an’s utilisation of Talmudic material has received even less attention, and a consensus is even more remote. The present paper seeks to advance, one small step, our understanding of the deployment of both corpora in the Qur’an by considering them jointly. More than occasionally, the Qur’an fragments and realigns demonstrable elements of the (likely oral) Gospel and the Talmudic traditions together in order to solidify its claim of being a correction to the shortcomings of both. As defined in discourse analysis, first addressee (or interlocutor) is the person involved in a conversation or dialogue. The figure of the Qur’an’s first addressee is a textual phenomenon linked to the structure of the text and its argumentative dimension. In my contribution, I will define the notion of the first addressee in the Qur’an, its linguistic forms and functions within the entire Qur’an. I will explore the following questions : The variety of the notions of ‘the first addressee’ ; the double aspect of fragmentation/unity of text after its collection and the role of the first addressee in the argumentative shape of the text. My contribution aims to show (i) how the dialogic relation between a Qur’anic enunciator and its first addressee reveals one of the main aspects of Qur’anic argumentation ; (ii) how the Qur’an legitimates the status of its first addressee as a prophet. (i) Qur’anic manuscripts : A tool or an aim ? (iii) Fragmentation/Compilation perspectives on the Qur’an text in the context of the history of its transmission. © International Qur’anic Studies Association, 2013. All rights reserved. 2019 Annual Meeting Registration NOW OPEN! New IQSA Blog Coordinator: Meet Justin!